During an OPCW training course on emergency response to chemical incidents, participants learn to use protective gear. After years of remarkable but largely unheralded success at ridding the world of mustard gas and deadly nerve agents like sarin and VX, inspectors from the Organisation for the Prohibition of Chemical Weapons (OPCW) have now been thrown into entirely new territory – working amid Syria’s bloody civil war and in the glare of the media following a surprise Nobel Peace Prize win two weeks ago. The acronym “OPCW” would likely have been met by blank stares a few weeks ago. Now, even though the organisation has been thrust into the limelight, relatively few people understand its mandate or the dangerous work undertaken by its inspection teams. “This is an organisation that for 16 years has carried out its work very quietly. I would say we have even shunned publicity…but now, we’re trying to make it work for us,” said Franz Ontal, head of inspector training for the OPCW. 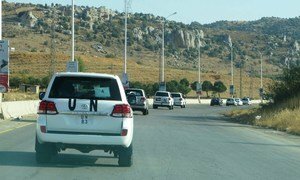 In an interview with UN News Centre, Mr. Ontal, himself a former inspector, spoke of efforts to ensure that the 27-member team, working jointly with the United Nations in the embattled suburbs of Damascus, will carry out its tasks in a high-pressure setting while maintaining staff safety. He added, not without some pride, the watchdog agency is honoured by the Nobel win and that its inspectors are well-prepared for both the hostile environment in Syria and the media spotlight. Earlier this month, the UN Security Council endorsed Secretary-General Ban Ki-moon’s proposal to deploy up to 100 UN and OPCW experts in a multi-phase operation to carry out its resolution on eliminating Syria’s chemical weapons material and equipment, scheduled for completion by 30 June, 2014. The Council passed its measure after Syria agreed to join the Chemical Weapons Convention following a chemical weapons attack in late August that killed hundreds of people in the Ghouta suburb. An initial UN-led team that was headed to inspect that incident came under sniper fire. While no one was injured, one vehicle in the convoy was severely damaged, forcing the team to postpone its activities for a day. Both incidents threw into stark relief the deepening crisis in the country, in which more than 100,000 people have already lost their lives and some 6.5 million others have been driven from their homes since protesters first sought the ouster of President Bashar al-Assad’s Government in March, 2011. The UN has called the OPCW into service as the implementing body of the 1997 Convention. It is responsible for monitoring and verifying chemical weapons destruction and has carried out inspections in Iraq and continues to work with, among others, the United States and Russia in destroying large stockpiles. In a recent success, the OPCW oversaw the destruction of 85 per cent of post-conflict Libya’s mustard sulphur agent. Yet, while the agency has tackled many challenges in the past, its current mission in Syria is different, said Mr. Ontal, underscoring that the war-time setting has added “another layer of concern” to the inspectors’ work. Normally confronted with stress related to dealing with hazardous materials, they are also carrying out their dangerous task while wearing flack vests and helmets to protect them from stray bullets and flying shrapnel. “These are two levels of stress that should never meet, but this is the environment in which we are working in Syria,” he said. The inspectors have been on the ground since early October but are just now wrapping up their first week of activities with the UN under the Council’s official mandate. Spokesman Michael Luhan said this week the OPCW is confident Syria will meet the 1 November deadline for destroying all equipment used in the production chemical agents. He also flagged another milestone reached, adding that a complete, official, inventory of all Syria's chemical weapons, munitions, and production facilities, was expected to be delivered to the Organisation’s headquarters ahead of schedule. Still, despite steady progress and cooperation on the ground, Mr. Ontal worries.